The Jungheinrich modular system offers flexibility and a multitude of options for future customisation. These include modular loadbearing components such as platforms, walkon load sections or auxiliary masts. Further options include an “adaptor system” for flexible choice of cabin widths and electronic height limitations for the masts. With the integrated warehouse navigation system (optional), the control computer on the EKS communicates directly with the Warehouse Management System (WMS). The truck can be driven to the destination under semi-automatic control. The operation is comfortable for the operator, movement errors are avoided, productivity and picking quality are significantly improved. The 48 Volt 3-phase technology ensures strong acceleration and high lifting speeds with unrivalled low power consumption. The advantage: full availability over 2 shifts in normal operation without the need to change the battery. The EKS operator can easily attain access to this performance. The cabin offers a generously sized workplace with outstanding vision. At the centre of the control concept, is the twopiece console for the operator and the large information display. There are a variety of optional packages and systems available, including RFID ground control and the Jungheinrich®warehouse navigation system. The EKS 208-210-308-312 man-up turret truck is available with optional transponder technology and warehouse navigation, which allows for maximum levels of productivity and security as lift truck performance can be tailored to the specific conditions of multiple areas within the warehouse. 3-phase motors with high torque. High acceleration for driving and lifting. Quick main and auxiliary masts. Range of chassis and cabin width options. 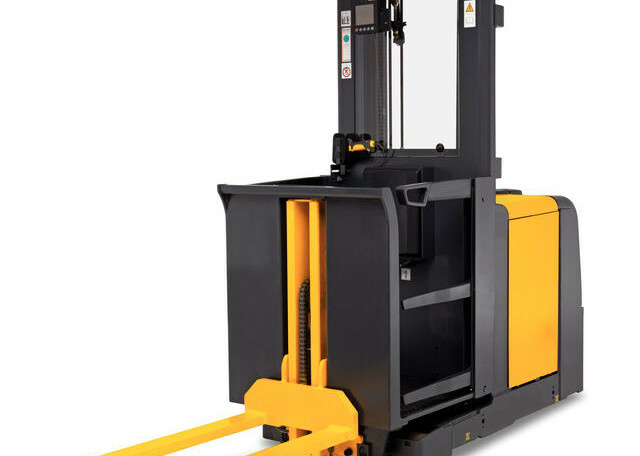 Load-bearing components: auxiliary masts, walk-on pallets or platforms. Mechanical rail guidance or inductive guidance (both optional). Adaptor system for customising the cab width to new operating requirements. Electronic height limitations for the masts. TÜV-certified control system (CAN-Bus) for maximum reliability. Double energy-saving benefits through regenerative braking and load lowering. Workplace lighting using energy-saving LED spotlights. Activation of the LED work spotlights upon reaching the destination (optional). Longer operating times on a single battery charge (up to 2 shifts). Battery rollers for quick battery exchange. Truck control by transponder technology. Continuous travel distance measurement for precise recognition of all warehouse areas. High flexibility for switching / safety functions (aisle end recognition, lift / drive cut-outs, speed reduction). Drive speeds optimised according to the floor topology. Linking the EKS to a Warehouse Management System (WMS) using a radio data terminal and/or scanner. Direct loading of the destination within the narrow aisle through the truck computer. Automatic vertical positioning under operator control. Automatic horizontal positioning under operator control. Optimised movements and dual cycling possibilities. Elimination of incorrect positioning by RFID location detection. High flexibility in the warehouse, as the existing WMS can be modified to cater for warehouse extensions. Factory-based integration into the safety computer. Configuration, commissioning and maintenance by Jungheinrich.